$495 Login For Price!PRICED TOO LOW TO ADVERTISE!!! Magicard PRIMA461 Holographic Overlay Film. Features a generic "Snowflake" design. Roll of 1000 overlays. 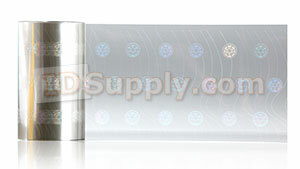 Magicard holographic overlays are especially designed for Magicard printers to ensure high quality finished cards. Tested and approved by Magicard R&D, genuine Magicard holographic overlays offer the best performance for your printer.